Ottmar Edenhofer is one of the world’s leading experts on the economics of climate change. He is designated director of the Potsdam Institute for Climate Impact Research (PIK) and Professor for the Economics of Climate Change at the Technical University Berlin. Moreover, he is founding director of the Mercator Research Institute on Global Commons and Climate Change (MCC) as well as adviser to the World Bank regarding issues of economic growth and climate protection. Furthermore, he is a member of the German National Academy of Sciences (Leopoldina) and member of the National Academy of Science and Engineering (acatech). Ottmar Edenhofer has published numerous articles in leading peer-reviewed journals (e.g. Science, PNAS, Nature Climate Change) and high-ranking disciplinary journals (e.g. Macroeconomic Dynamics, International Tax and Public Finance, Environmental Research Letters, Climatic Change) and authored various books. 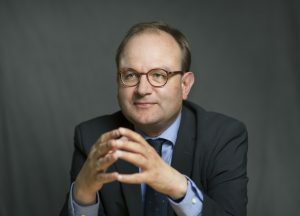 From 2008 to 2015 Ottmar Edenhofer served as Co-Chair of Working Group III of the Intergovernmental Panel on Climate Change (IPCC), shaping the Fifth Assessment Report on Climate Change Mitigation substantially.